When it comes to baking pies at home from scratch, one of the most common questions I hear is “Do I have to blind bake the pie crust for my pie? Or can I just bake the pie without doing so?” . The answer to that question depends on what kind of pie you are making and I will clarify that in the post below. It’s a really simple yet important concept to understand, and knowing, how, when, and why to blind bake pie crusts will help you create professional quality pies at home. What Is Blind Baking A Pie Crust? Blind baking refers to the act of partially ‘pre-baking’ a store bought or homemade pie crust, without the filling. 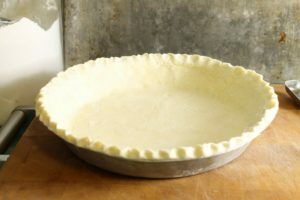 The raw pie crust is lined with parchment and filled with pie weights to prevent the crust from bubbling up and the sides falling in on itself as the crust bakes. Blind baking prevents the pie crust from going soggy and not baking fully when using wet or uncooked fillings. 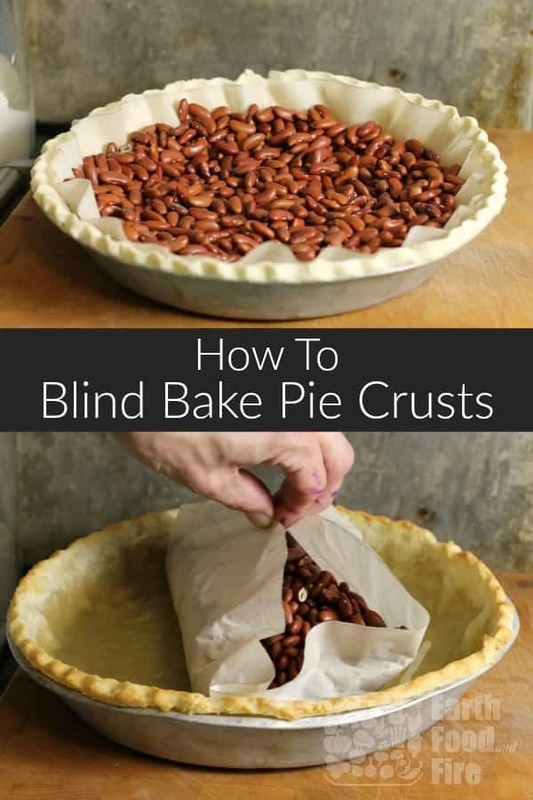 When Do You Need To Blind Bake Pie Crusts? There are two instances when you need to blind bake pie crust. There are a few times when blind baking can be beneficial, but is not necessarily required, such as when making apple pie. If the apple pie filling is very wet, blind baking will help prevent a soggy crust. If the apple pie filling is fairly thick and the juice has been cooked of first, blind baking may not be required. Do I Have To ‘Dock’ The Pie Crust? Docking refers to pricking the bottom of the crust with a fork or with a docking roller, (amazon affiliate link) to prevent the bottom of the crust from bubbling up. 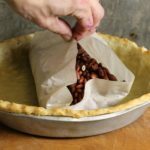 This is most often done when blind baking without pie weights, or when you need a fully baked pie crust for a cream or pudding filled pie. I never have much success with this though, so instead I blind bake with pie weights first for about 30 minutes, and then if I need a fully baked crust, I remove the weights, dock the crust, and continue baking until the crust is golden brown and fully cooked. The pie weights help hold up the sides for the first portion of baking, and then half way through, docking prevents the bottom from bubbling up once the weights are removed. So How Do You Blind Bake A Pie Crust? It’s really quite easy! There are a few things you will need in order to blind bake pie crusts though. You’ll need to have some parchment paper, as well as pie weights, and ideally a chilled pie crust. Pie weights are little metal or ceramic beads and are easily sourced on Amazon. You can buy pie weights here. 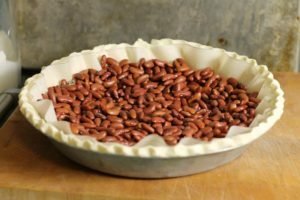 Lacking actual pie weights you can also use rice, raw beans, or dried lentils to weight the pie crust down as it blind bakes. Just make sure not to use the beans or rice for eating afterward! Just save them and re-use them for blind baking. If using homemade pie dough, roll out the chilled dough, and line a greased pie pan with the raw dough. Make sure to gently press the dough into all the corners to remove air pockets. Crimp the pie edges and remove any excess dough. Line the un-baked pie crust with parchment paper, making sure the paper comes up the sides of the pie. Fill the parchment lined crust at least 2/3 full with pie weights making sure they are evenly distributed. Chill the crust for at least 30 minutes to help prevent shrinkage. Bake the weighted pie crust in a pre-heated 375F oven for 25 minutes. After 25 minutes remove the pie crust from the oven, and carefully lift out the parchment with the weights. Fill the blind baked pie crust with your filling and bake the filled pie as your recipe directs. (Optional): If making a pudding or cream pie that uses an unbaked filling, prick the bottom of the partially baked pie crust with a fork (this is called docking) and return the pie crust to the oven and bake for another 5 to 8 minutes, until the crust is golden brown. Pretty easy isn’t it!? Let me know how your blind baking experience went, and if you have any questions leave them in the comments below! 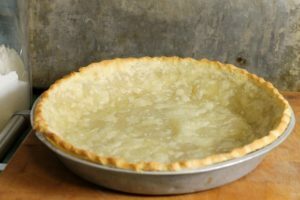 Blind baking pie crust is essential when baking custard pies or pies with an un-cooked filling. Learn how to do it properly with this easy to follow guide. 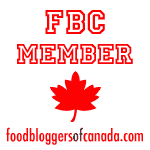 Keyword how long do you have to blind bake pie crust?, how to blind bake pie crust? If using homemade pie crust, roll out the chilled dough, and line a greased pie pan with the raw dough. Make sure to gently press the dough into all the corners to remove air pockets. Crimp the pie edges and remove any excess dough. Bake the weighted pie crust in a pre-heated 375F oven for 25-30 minutes. If making a pudding or cream pie that uses an unbaked filling, prick the bottom of the partially baked pie crust with a fork (this is called docking) and return the pie crust to the oven and bake for another 5 to 8 minutes, until the crust is golden brown. This post has been so helpful! I need to get some of those weights and try this the next time I make a pie crust – soon I hope!! 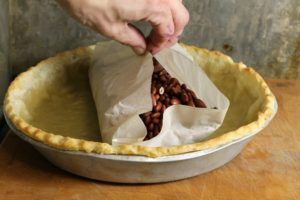 If you don’t have (or cant find) pie weights, beans will do in a pinch! This is perfect timing as we are going to be baking lots of pies over Christmas. This is so perfect for the holidays coming up! I can’t wait to try this! So many great tips with the holidays upon us. Can’t wait to start baking. Thanks for sharing! I don’t make a lot of different pies but I do make quiche quite often. I’ve never used pie weights. I usually just dock and blind bake. Have to try with weights as the sides of my crust often collapse in places! I blind bake with weights first to keep the sides up, and then if I need the bottom cooked more I’ll dock the bottom and cook it until it’s golden. Then add my quiche or pudding filling! This is a skill that I needed to learn with the upcoming holiday. I always tend to have raw crust because I don’t ‘blind’ bake my crusts. Thank you for this post!